Here are some simple staging techniques to enhance your home this Christmas to appeal to all buyers! Set the mood before the potential buyers even set foot into the house. Don’t break out your collection of fairy lights that adorns every orifice the house or the giant inflatable Santa and reindeer that dominate the front yard. Save that for your new house In fact, refrain from any fairy lights if possible. Don’t forget that all the viewings by potential buyers will be during the day, and while fairy lights may look lovely at night, they can look very messy in daylight. Instead, hang a festive wreath on the front door. Yes; just one wreath. Sometimes all you need is a hint of holiday decor. Not only does this decrease the clutter factor and make for more open spaces, it also allows the flexibility of changing the decor as soon as the holiday is over. So instead of going for an ornately decorated Christmas tree (honestly; how many of us actually enjoy taking DOWN the tree? ), how about a Christmas themed table centrepiece instead? Try a centrepiece that plays on the Christmas colours of red and green. Or a simple glass bowl of pinecones and berries. 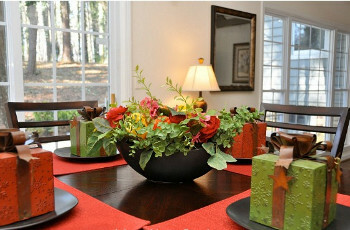 Then add a touch of Christmas by setting the table with boxes of presents or garlands of holly. These immediately give a very classy feel of Christmas without the clutter and and can be easily replaced with napkins after Christmas. Do you love your Christmas decorating and are upset that selling your home over Christmas is going to interfere with that? 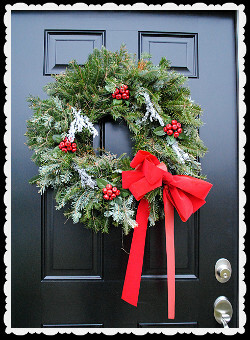 If you have a choice, you may wish to hold off selling your home till after the festivities are over. If not, sorry, you’ll just need to rein in a bit this year. It’s a known fact: clutter eats up real estate, so now is not the time to deck the halls! However, no one wants to be the Grinch to your Christmas, so choose one area of the house to decorate and keep it simple to avoid overwhelming buyers and distracting them from the actual house you’re trying to sell. Rather than filling your living room with a large Christmas tree, choose a smaller version that fits neatly into the corner of a room without any obstruction. Keep ornaments colour coordinated and omit the tinsel. While decorating is personalizing, staging is DE-personalizing. What you are aiming for are those gorgeous but generic kinds of trees you see in the magazine and catalogues! Allow it to simply accentuate and not overwhelm the room. Don’t block or cover up important selling features such as fireplace mantels, stairs, or beautiful views out the windows. Don’t leave all of your presents out under the tree. Put them away and just display a group of 3 to 5 attractively wrapped empty boxes. It’s simply not worth the risk. It’s also a good idea to stay away from religious items, which may be distracting or sometimes even offend potential buyers viewing your home. Restricting your religious items also helps protect your own privacy. As you can see, it’s not hard to strike the right balance between holiday spirit and presenting an uncluttered, inviting property that buyers can imagine themselves in. One last tip: Ensure your listing photos are taken without any Christmas decorations. Nothing dates a photo like holiday decorations; plus details like that in a photograph are simply too distracting.